Sourav Ganguly - Royal Bengal Tiger ? With Cricket, Cricket and more Cricket everywhere, I am but compelled to write about Cricket. With the continuing media, frenzy going on I have noticed some Kings / Legends / Champions all over the media. One such King is Brand Sourav Ganguly. This Cricketer nicknamed the ‘ Royal Bengal Tiger’ by his fanatical fans and his distant cousins the Cricket ‘historians’ is amongst those hogging the limelight most. 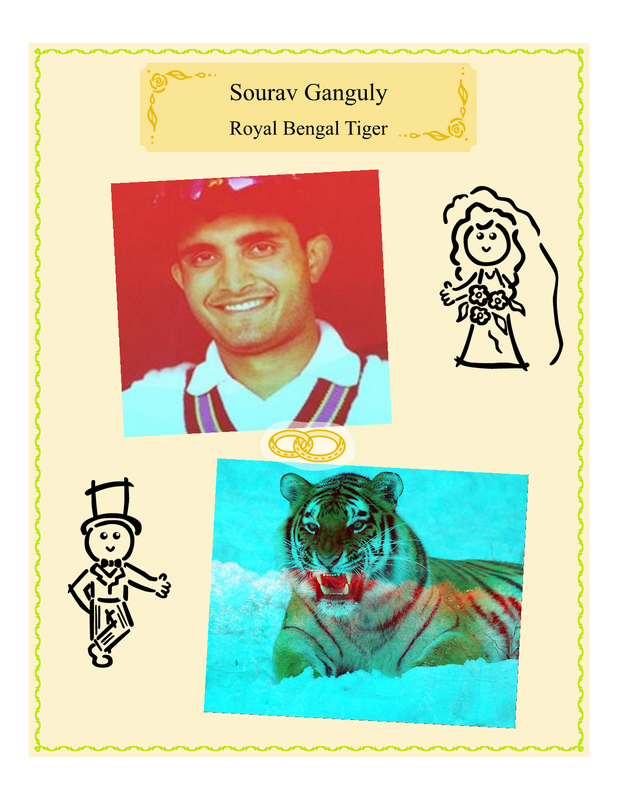 One of the things I am most intrigued about is the nickname ‘Royal Bengal Tiger ‘ given to Ganguly. I don’t want Ganguly fanatics to misunderstand me. I am writing this post on a lighter note in the backdrop of the ICC World Cup Overdose , I don’t mean any offense to Ganguly. I have tried to look over and over again at the photos available of Ganguly and the Royal Bengal Tiger trying to find some resemblance. I have looked at all the angles available. Sorry to say that I couldn’t find even 1% likeliness to write about. Apart from the physical similarities I have tried to find some mental or physiological similarities, again I have failed. The Ganguly I watched on television was more often than not a nervous character prone to nail biting and impatience, most unlike a Tiger. I admire the Tiger for what he is, amongst other things he is also the national animal of India. 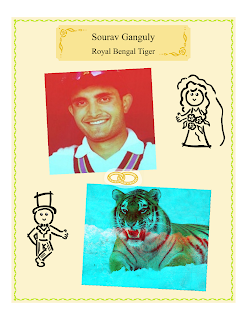 If anyone has seen some hidden resemblance between the Tiger and Ganguly please tell me I am really anxious to find out. I really don't know where you are from but I can tell you why he is called the RBT. When you are shunned by critics, your playing captain, your playing team coach, your franchise owners and you come back and prove all of them wrong, you look eye to eye with Aussies and beat them in their own game, it takes tremendous courage. It requires tremendous mental strength and this where the comparison with a RBT comes in. Also a RBT is a very graceful animal just like the way Sourav plays! So there you go. Now you are educated! I can't stop laughing,Sourav Ganguly has the basic quality required in Indian Public Life 'thick skin'.If he has his way and he has till now,he will keep coming to play with a walking stick.One has look at Indian pride and nothing else,Sourav's cousins are everywhere,they don't care about Indian pride,their cousin comes first.